Burlington-based MC and producer Christophe Morel was tagged with the pseudonym Face One while growing up in Queens, where he was a graffiti artist. But last September his hip-hop alias took on a painful irony when he fell 16 feet into a concrete pit. Among other maladies, Morel broke his jaw, which was wired shut, restricting him to a liquid diet for several months. “If you want to try a good meal, I’d suggest a goulash shake,” he jokes. For an MC, a functioning jaw is something of a prerequisite. Unable to speak, let alone rap, without pain, he turned his attention to beat making. He spent the fall producing beats daily, sometimes churning out several per day. The music, and 2nd Agenda front man Andy Lugo. From September 2010 to January 2011, the two experimented with adding live instruments and vocals to Morel’s new beats. The result is a new EP, Face One & Andy Lugo, that fuses Morel’s unconventional production talents with Lugo’s conscious songwriting style. Lugo and Morel met in that typically Burlington sort of way, “just around.” Morel recalls regularly seeing Lugo playing on Church Street and at open mics. Lugo, who now lives in Rutland with his wife and child, has been hosting a Wednesday-night open mic at Burlington’s Manhattan Pizza and Pub for several years. Soon, casual conversations developed into a friendship centered on a shared idea that music, specifically hip-hop, could reflect more than aggro posturing. Lugo says Morel’s unusual beats challenged him to alter his approach to writing. “Hearing the way Andy works helped me hear music differently, too,” says Morel. Both Lugo and Morel credit Burlington with shaping their idealistic, artistic worldviews. “Seeing the evolution of so many different genres in Burlington, I started to realize that it’s all about fusion,” Lugo says. “I don’t consider myself to be a musician. I consider myself an artist, which opens up doors. Whereas being a musician, it’s, like, Well, what kind of music do you make? Are you a jazz musician? Do you play rock? “Really, it’s about taking pieces of genres and making them your own,” he continues. Similarly, Morel prefers to think of himself as a poet rather than a rapper. 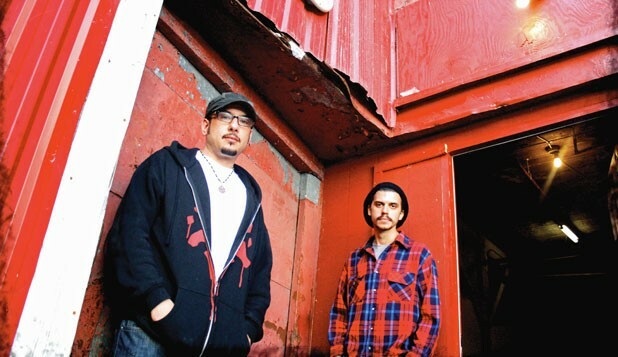 Both Lugo and Morel say that the Queen City offers a unique opportunity to create music without being pigeonholed by outside constraints. “You can play any style of music and not necessarily be bound by living a certain lifestyle,” Lugo says. He cites hip-hop as an example, suggesting the pressure to look or act a certain way would be greater in a grittier urban environment. And he would know. Lugo went to high school in Southern California and witnessed the evolution of gangster rap firsthand. Those violent experiences soured him on hip-hop, a genre he wouldn’t come to embrace until he landed in Burlington and discovered artists such as KRS-One and Mos Def. The influence of conscious hip-hop has long been evident in Lugo’s work with 2nd Agenda. But it is especially critical to his endeavor with Morel, which both artists say is rooted in an affinity and respect for Burlington. Nowhere is that more apparent than on the EP’s lead cut, “Little City,” the duo’s hip-hop love letter to the Queen City and a track that represents the essence of their collaboration. “It’s not where you’re from, it’s where you’re at,” says Morel. Face One and Andy Lugo will perform on 105.9 FM the Radiator Wednesday, May 4, at 8 p.m. They celebrate the release of their EP at Radio Bean on Saturday, May 14.